Over one-third of the entire Earth’s population uses social media today, and that’s a fact. The penetration of social media is more in some countries than others, with a survey stating that 80% of US citizens used social media in 2017. Ask any millennial, and they’ll tell you how they use Twitter to get to know about all the latest banter and news, how their favorite hashtag on Instagram is #foodporn, and how they “like” Facebook pages of businesses that provide them with funny or interesting content they want to follow. Social media is an incredible avenue for businesses to market themselves and engage with their customers, and some big brands are hitting the nail right on its head, here. 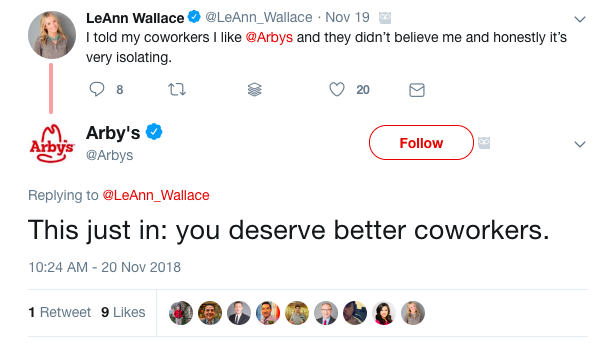 Arby’s interacts with (potential) customers on a personal level by getting in on conversations about their everyday life. 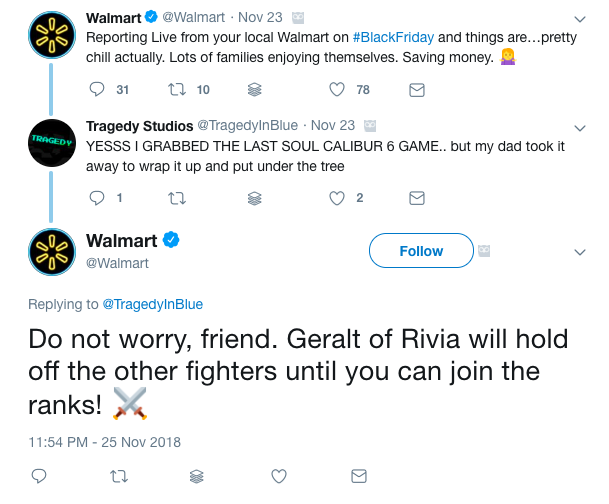 Here’s a tweet of Walmart using pop culture and gaming references to identify with its customers as a friend. And no great list of tweets can exist without a mention of Twitter’s (arguably) sassiest business account, Wendy’s. 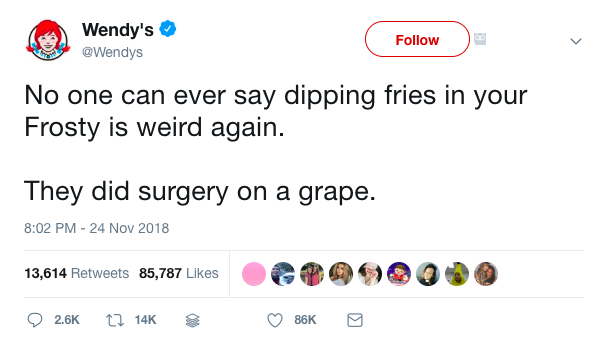 One of their most recent tweets references a meme that’s taken over the internet as of late – a video of the da Vinci Surgical System performing a “surgery” on a grape. And look at the number of likes and retweets on that one! While manually monitoring social media mentions to engage with your audience is unavoidable, what about the hundreds of other general tweets and posts from businesses that you see on social media everyday? Do you think that manually typing them in one at a time is going to help businesses accomplish this at scale? The answer is, “Probably not”. As a business, you can’t afford to keep posting everything manually on every single occasion. However, you can employ tools and methods to automate your social media marketing and content promotion. In this step-by-step guide, we’ll be talking about how you can do just that for your business, and make sure that you save time while maintaining an active and engaging online social media presence. Working with social media posts and content promotion at scale requires you to plan ahead. At any given point in time, you’re going to have a bunch of things that you want to promote on social media – may it be your own content, details about an event that you’re about to host, or offers that you’re running currently. Set up a weekly recurring task to decide the content you want to cover over the next week. This gives you time to select the right kind of content that your brand is working on promoting, and helps you incorporate this smoothly in your social media plan. Talk to the stakeholders and the content team in your company on the regular, and ask them what they’d like you to promote over the next week on your social media. This helps you plan well ahead of time, and doesn’t put you in a position where you have to sneak in some posts in the middle of the week in a rush. Step #2: Line ‘em all up! Once you’re done planning the content that you are going to post on your social media, you need to line them up to get posted throughout the course of the week. Manually sharing every single one of these posts in every single social media website is, without a doubt, a cumbersome task. Thankfully, tools like Buffer and Hootsuite allow you to do just that – by scheduling your posts and promotions at times that will work best for your audience. Spend some time in the beginning of the week to have a bunch of your posts or even retweets lined up to go out throughout the rest of the week. Make sure that you’re posting at times that are bound to give you the most user engagement and returns – you can take a look at the best times to post on Facebook, Instagram, Twitter, and LinkedIn to optimize for this. Load ‘em all up into the tool you’re using to get this done, and voila! Your social media quota for the next week is done – all in less than two hours of work. Sharing your content on social media and letting them stay there is not the end of your work as a social media manager. After you’re done with automating your social media promotion, you need to track the viewership and engagement metrics on your posts to know what’s working and what’s not, for your business. While a tool like Hootsuite gives you the engagement numbers for all your posts across websites in one platform, you also need to realize that getting likes, reactions, and retweets might not equate to getting any real return on investment for your promotions. If you want to track the impact that your social media is making on your business, set up and use Google Analytics for your business. 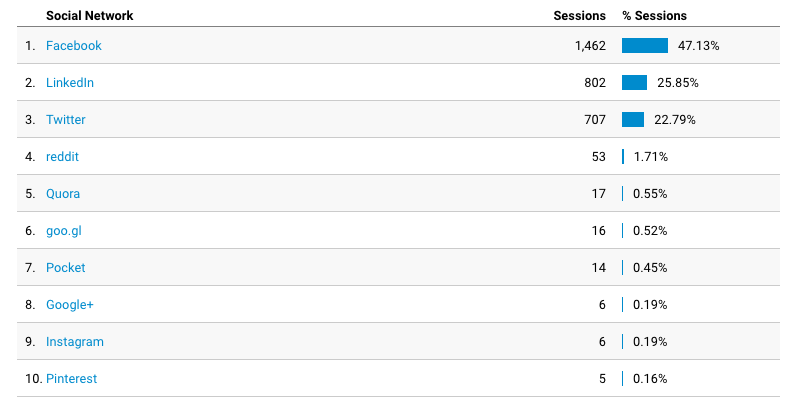 Head over to Acquisition > Social > Overview in the left sidebar to view the social media sites that are giving your business’ website the most amount of visits. This will help you double down on your efforts to promote your content on the right websites. And that’s really all that’s there to it! The most important part though, is to make sure that you repeat this week in, week out and fine-tune your process to get the best results for your business from your social media efforts. Work on bringing in more online social media automation tools into your chain to make your tasks more streamlined, over time. Harsha Annadurai works as an Inbound Marketer at Synup. His excessive love for music and football has led many to believe that he was a jukebox in a football stadium in his past life. You can follow him on Twitter.